Ireland’s top interiors experts talk their favourite lounging looks, and how to put these trends to work. Diana Valentine, owner of Home-Lust.com reckons that creating a style for any room has a lot to do with psycology, and should be full of your own personality. 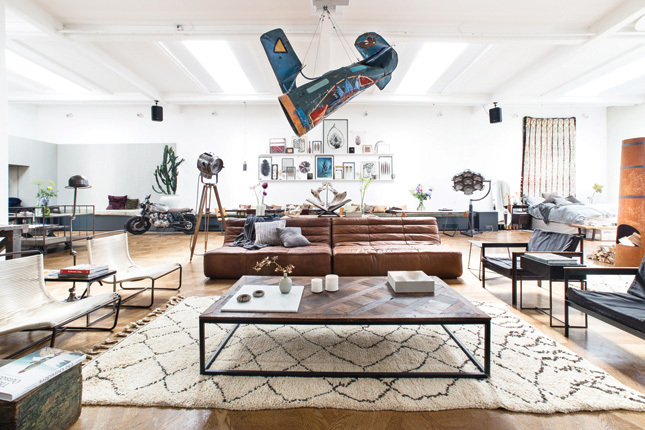 “Some of the best-styled interiors I’ve come across lately, outside decor magazines are created by a Dutch design agency called The Loft. They run a recurring conceptual pop-up store, devising seductive spaces that are both refined and highly functional. One of my favourite projects by The Loft is this penthouse studio that centres around a large living area decorated in a classic yet idiosyncratic style, which might be hard to classify, but I call it preppy minimalism. The focus here is on communal spatial arrangement, beautiful striking shapes and the use of natural materials like wood, leather, textiles and ceramics. I love the combination of classic mid-century style armchairs, and the playful, über-modern sofa. The vibe is relaxed, yet highly elegant.